OAKLAND, Calif. (KGO) -- Stephen Curry overcame a slow start to score 23 points as part of his sixth career triple-double and the Golden State Warriors won for the 29th time in 30 games this season, 122-103 over the Sacramento Kings on Monday night. Curry added a career-high 14 rebounds and 10 assists, Klay Thompson scored 29 and Draymond Green had 25 for the Warriors, who have won 33 straight regular-season home games. Warriors finish 2015 with a 42-1 home record, tying the Orlando Magic in 1995 (42-2) for most home wins in a calendar year in NBA history. Omri Casspi scored a career-high 36 points, tying Mike Bibby's team record with nine 3-pointers for Sacramento. 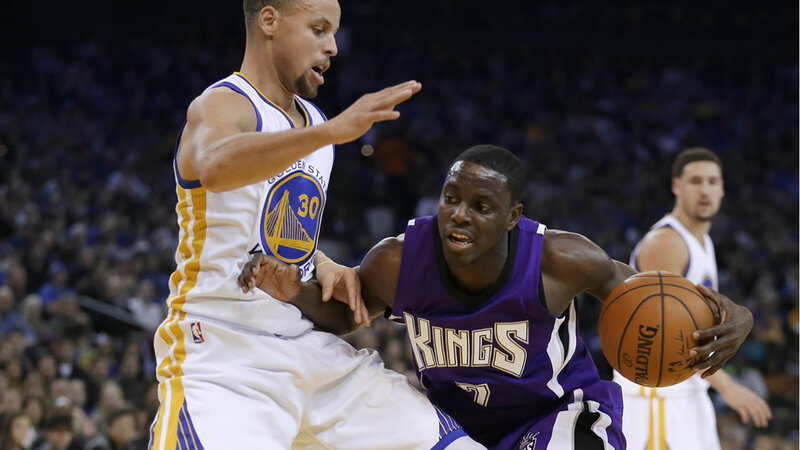 But the Kings still lost their 11th straight against their Northern California rivals. The Kings were excited to have a healthy DeMarcus Cousins for the first time in three meetings with the Warriors this season. But the All-Star big man played less than 13 minutes before getting ejected. After sitting out most of the first half in foul trouble, Cousins was upset after getting called for his fifth foul in the third quarter. Monty McCutchen then called Cousins for a technical, setting him off on a tirade that led to another technical called by Mitchell Ervin and an ejection. Cousins had to be restrained by teammates before being escorted off the court. Curry made three of the four free throws to start a 15-0 run that turned a two-point deficit into a 79-66 lead for the Warriors. Curry's 3-pointer just before the third quarter ended put Golden State up 90-75. After trailing early, the Kings went on a 28-7 spurt to build a 41-30 lead on one of Casspi's seven first-half 3s. But Casspi's sharp shooting seemed to wake up Curry, who missed his first six shots and was scoreless for the first 20:44 of the game. Curry ended that drought with a 3-pointer that started a stretch of him scoring 17 straight Golden State points in the final 3:16 of the half. Curry hit five 3s and a layup during that span to the delight of the home crowd. Casspi hit four 3s in that same stretch to help Sacramento take a 61-58 lead at the break.